Very interesting Botes. 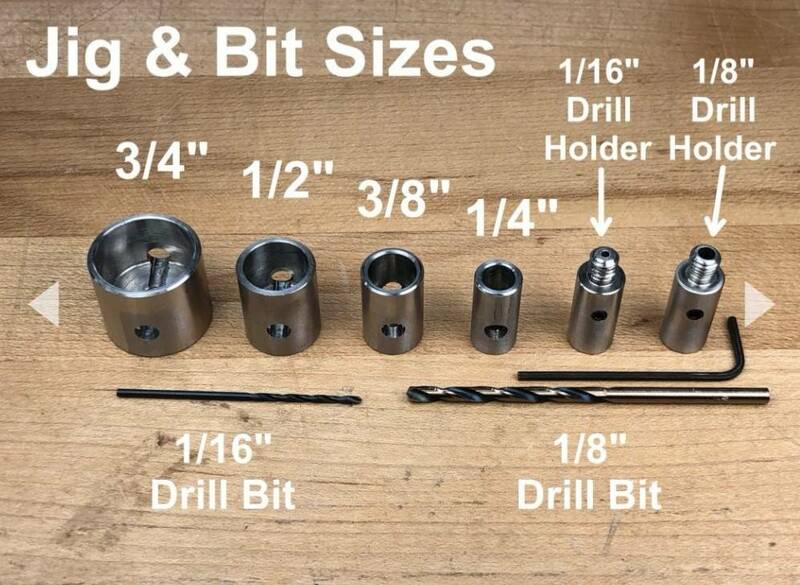 So you get this full set which drills holes in different size dowels right up to very large ones? Then the other outfit you bought from the USA, makes dowels up to various sizes? All those boxes on Rob Cosman's site would use 1/4 inch dowels, just wondering what else you might use the larger ones on. I finished that box with the Tallowwood, and not really happy with the end result. The grain on it is very twisted and I didn't get a nice clean cut with my 1/4 inch core bit. It all works ok, but the core bit ripped little pieces of timber out which you can notice where the dowel sits in it. Back to your kits, then if you wanted to use some sort of similar technique with larger dowels you would need larger core bits also. The Rob Cosman method seems to require that the lid sits between the box ends rather than the lid sitting entirely on top of the box. This strikes me as being a limiting factor. The only way I can think of to use this on what think of as ‘normal’ box lids would be to run the dowel the full length of the back. Not sure this would look very elegant at the ends. Has anyone tried this or found another solution? Hi Brian, this link shows some photos of a traditional box lid with the dowel hinge. Hi Paul, the jig comes with the holder for different size dowels as per the photo. Making the dowels in the same material you use for the box is the trick though. I wanted to use the smaller dowels and after trying a few jigs to make the dowel I gave up on it and bought the Veritas dowel maker on the right size as per the link below. Its one jig for a specific size so it's not able to make various thickness dowels. As for using the larger dowels. I saw Rob Cosman used the biggest size to make a blanket chest which is essentially a massive box. Thanks, Jacques. As I suspected, the dowel runs right to the end of the box. It seems a little incongruous to go to that much trouble to make an ‘invisible’ hinge then have an odd circle of end grain on each side of the box. Still a good hinge method - and inexpensive per box. I’ll give it a go and see what it’s like in practice. I suppose it might be possible to glue a matching piece of side grain on the end of the dowel to disguise it a bit. I remembered today why I made a few of these a couple of years ago and never made anymore,..!!!!!! I'm wishing to give this hinge type a bit of a go on a few projects. If you happen to have a kit that's in good order that you no longer want - why not drop me an IM and offer it for sale to me?